Trial Week Season 3 Starts 2nd May! What is Tribe Team Training™? Tribe Team Training™ is a cost effective way for everyone to get the expertise, guidance and regular coaching from a Tribe Team Training™ Coach. Each program runs for a 6 week period, which is called a ‘season’. We release seven seasons annually and there are 3 variations of Tribe Team Training to choose from. Tribe LIFE ™ literally stands for Low Impact Functional Exercise, and is designed to increase strength, boost your cardiovascular health and increase your overall quality of life and wellbeing. Tribe LIFE™ program allows you to be kind to your joints while achieving the right intensity to decrease body fat, increase energy levels and be stronger, fitter and more mobile, season after season. Training is twice a week and tons of fun. WANT TO KNOW WHAT TRIBELIFE™ LOOKS LIKE? CLICK HERE! 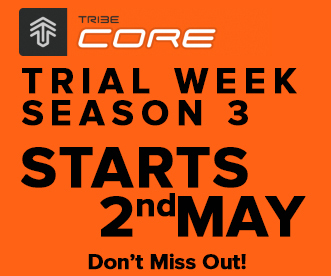 Our TribeCORE™ program has been deliberately created to build a pillar of strength through the center of the body. The program is designed to bring toning, strength and stability to your core, which is ideal for ladies who have given birth, or people who are generally weak in the core. When we refer to your ‘CORE’, we are referring to your belly, bum, back and shoulders. Our TribeCORE™ program, also twice a week, is aimed at gaining core control, grace, intelligent movement, stability and flexibility. WANT TO KNOW WHAT TRIBECORE™ LOOKS LIKE? CLICK HERE! TribeKIDS™ is fun, stimulating and energy sapping….just what busy 7 – 11 year olds need! Your child will run, jump, leap, hop, skip and roll, all the while learning new games, perfecting fine motor skills and practicing natural body movements. Your children will be doing all the age-appropriate ‘cool’ things that make them faster, fitter and stronger. WANT TO KNOW WHAT TRIBEKIDS™ LOOKS LIKE? CLICK HERE!